So delicate and papery, I love the old fashioned ramblers. Pink and blue -- I want to dismiss the combination as corny or sentimental but in pictures like this it's utterly compelling. I love it! Rather "stunning" i would say Merisi. Beautiful shot! 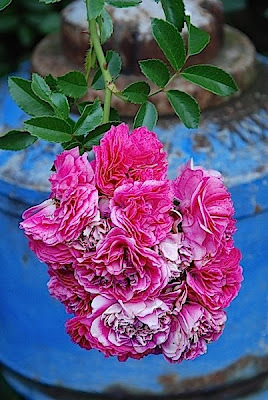 Beautiful rose, the Morning Rose! Never have met one before before today! THe roses raise the blue to sublime. These roses grow so rampantly, boundless energy and color. These roses are sumptuous! And a blue fire hydrant? Is the blue to signify water? What color are the Viennese fire trucks? As you know over here, we use red for anything to do with fire.